• Structure ID: NBI: 1396. • Location: River Mile 838.7. • River Elevation: 233 Feet. • Daily Traffic Count: 7,969 (2002). 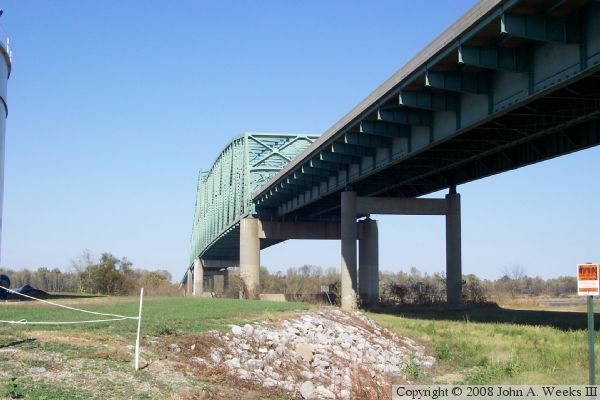 • Bridge Type: Steel Truss Through Deck. 2,480 Foot TN Approach Spans. • Width: 78 Feet, 4 Lanes. • Navigation Channel Width: 900 Foot Main Channel, 500 Foot Secondary Channel. • Height Above Water: 99 Feet. • Date Built: Opened December 1, 1976. 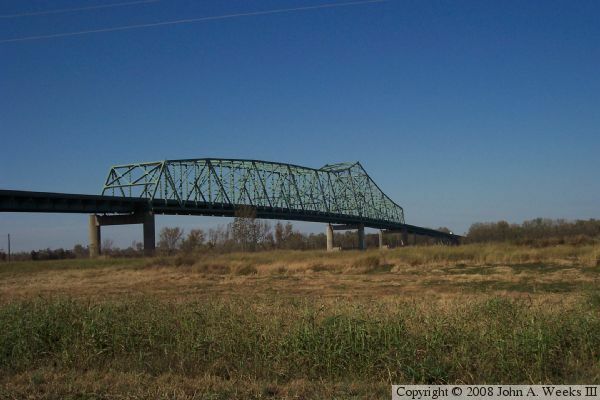 The I-155 Caruthersville Bridge is the northernmost bridge over the Lower Mississippi River, with the combined flow of the Upper Mississippi and the Ohio River. This bridge is interesting in that it is not symmetrical. 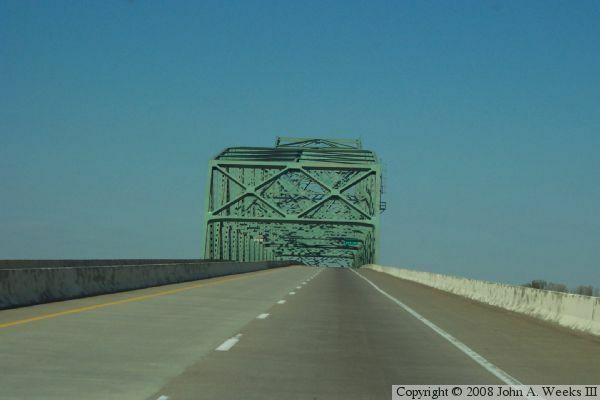 The structure on the Tennessee side is much longer than the structure on the Missouri side of the river. That is due to the bridge being located on a curve in the river, and the current is towards the outside of the curve, making the river deepest near the east bank. The US Army Corps of Engineers has been working to stabilize the riverbank on the outside bank of the curve by placing rip-rap along the edge of the river channel. It is hoped that this will keep the river from migrating any further east, possibly bypassing the bridge. 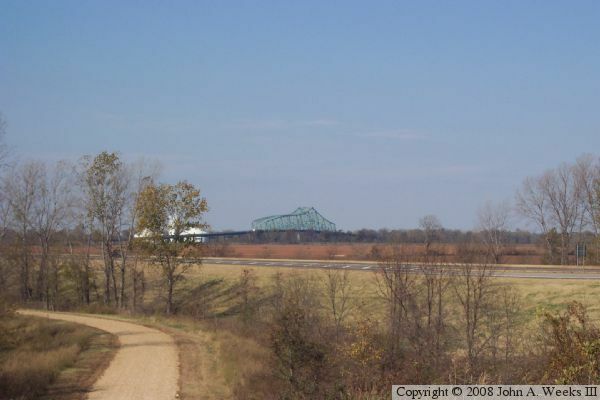 The Caruthersville Bridge sits in a geologically interesting place in that it is only 6 miles from the New Madrid Fault. A 1993/1994 study found that bed rock was located 2700 feet under the surface, so a significant earthquake event would almost certainly create severe liquefaction. The bridge as it stands would not hold up to liquefaction. Two proposals were developed to fix the bridge, one a partial retrofit, the second a total retrofit. The problem is that the price tag on these repairs are very expensive. The repairs are still on hold as of 2007. 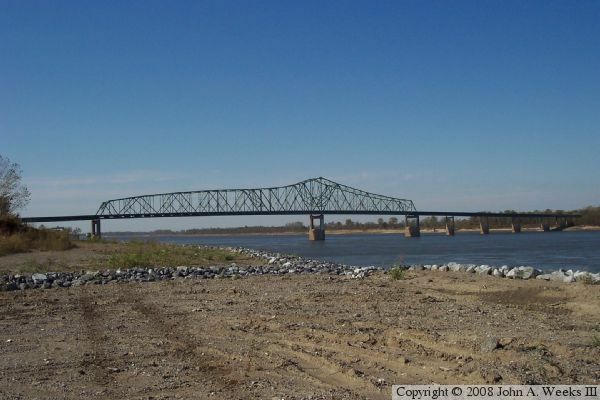 Update—the Caruthersville Bridge was closed during the afternoon and evening of January 18, 2010, after a river tow struck the bridge. A tow boat was heading downriver and struck a bridge pier about 5 PM. 15 barges broke loose. The barge that struck the bridge was heavily damaged and nearly sank. The bridge was closed to allow inspectors to check for damage. The all clear was given, and the bridge reopened around 9 PM. The photo above is a view of the main bridge truss as seen from the east corner of the structure. The photo below is a profile view from a river landing located northeast of the bridge. Note the newly installed rip-rap on the riverbank. Also note that the longest span is adjacent to the east bank of the Mississippi River. The photo above is a view from the Tennessee TN-181 overpass, looking northwest towards the northeast side of the structure. 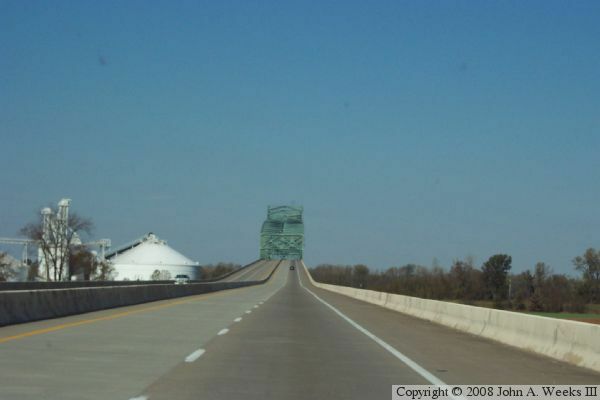 The photo below is the first photo of a three photo set showing a typical river crossing heading northbound across the Caruthersville Bridge. Thees two photos are the final two photos of a three photo set showing a typical river crossing heading northbound across the Caruthersville Bridge. The photo above is climbing the incline leading to the main truss structure. 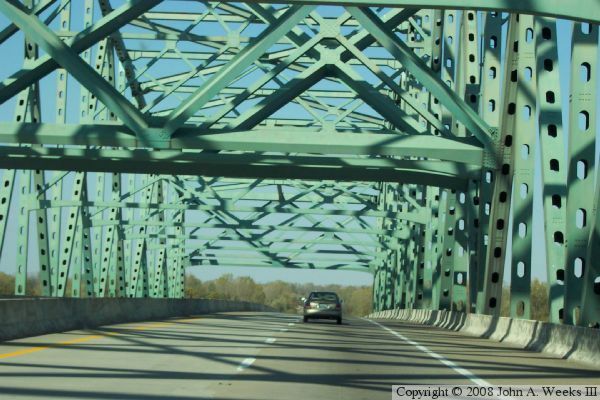 The photo below is a view traveling through the truss span. 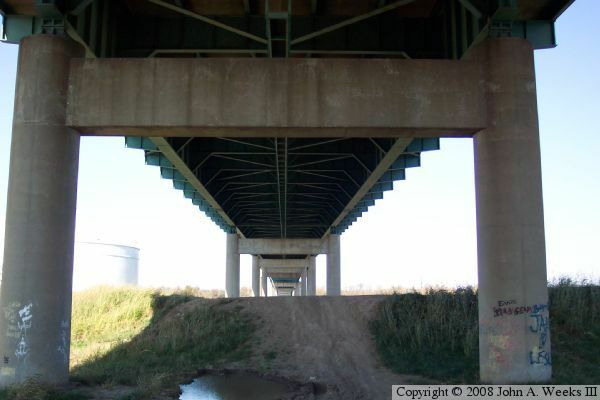 The photo above is a view looking northwest from under the bridge outside of the levee on the east side of the Mississippi River. The photo below is a view of the south corner of the structure from a vantage point located inside of the levee. The tank in the distance in the upper photo is on the very left edge of the photo below.